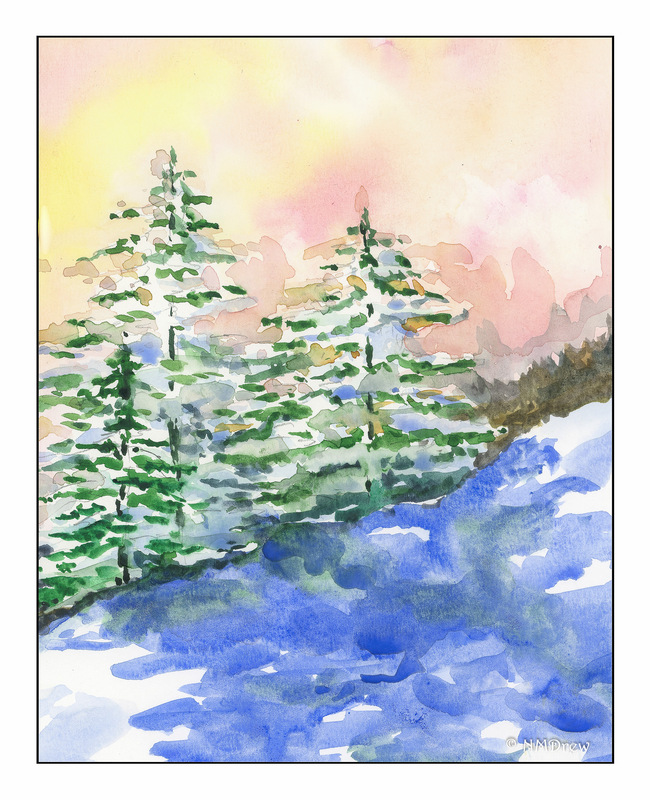 More working with wet-in-wet, as well as white and shades of white. Not sure if the idea that the part of the lower trees facing the viewer convey a sense of shadow – being darker – before moving into the shadows in the foreground. With wet-in-wet, it is really important to understand how a paper responds to water. 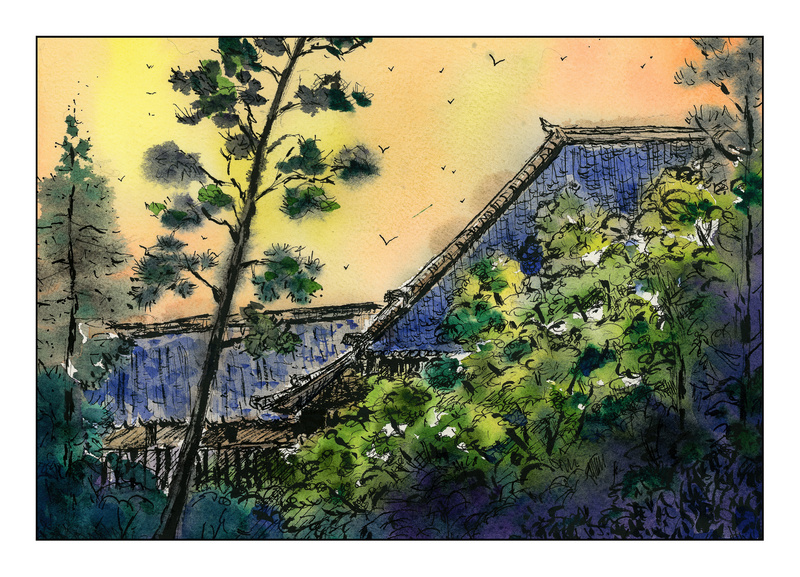 This is Canson XL, a student grade paper, but one that I like to use when experimenting. I’ve never really worked at using it really wet, but the results of focusing on it – having it sopping, having it damp – is beginning to yield some decent results, such as few blooms and hard edges. I’ve been sitting on this picture, doing some research before finishing it. 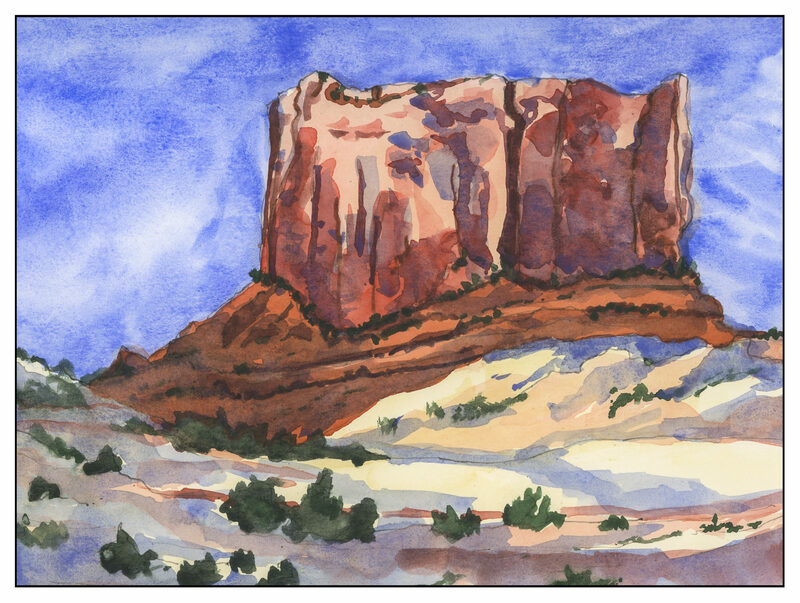 By research, I mean watching videos on painting the red rocks of the American West to figure out colors, practicing with colors and washes, and finally, practicing with blues over the colors. as this mesa has a lot of shadow areas. Above, color practice. I used Pyrrol Orange, Organic Vermilion, Burnt Umber and Burnt Sienna for most of the reds and oranges. The grey-green is a combo of Sap Green, Cobalt Green, and Payne’s Grey. 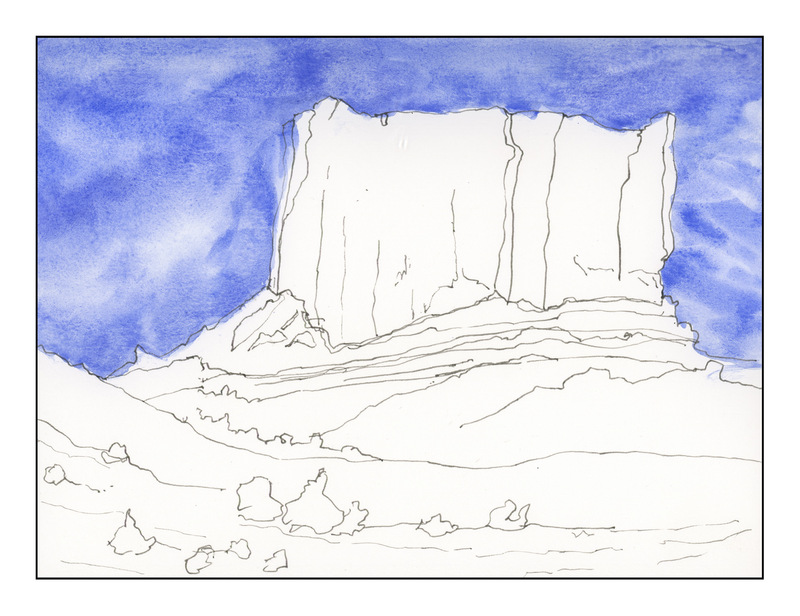 The blues are Ultramarine and Cobalt. And below, the final result. This is perhaps the first “researched” or “practiced” painting I’ve done. I usually just go-with-the-flow. The pay off is pretty good. I’m still not really sure if this sketchbook is good for anything “serious” but it did a good job in the end. It is really curly paper when it dries! For the next week, my schedule is a bit different. I have to be in to work 30 minutes earlier than normal, so I did this quick sketch in my Stillman & Birn softcover book. The ink is iron gall. 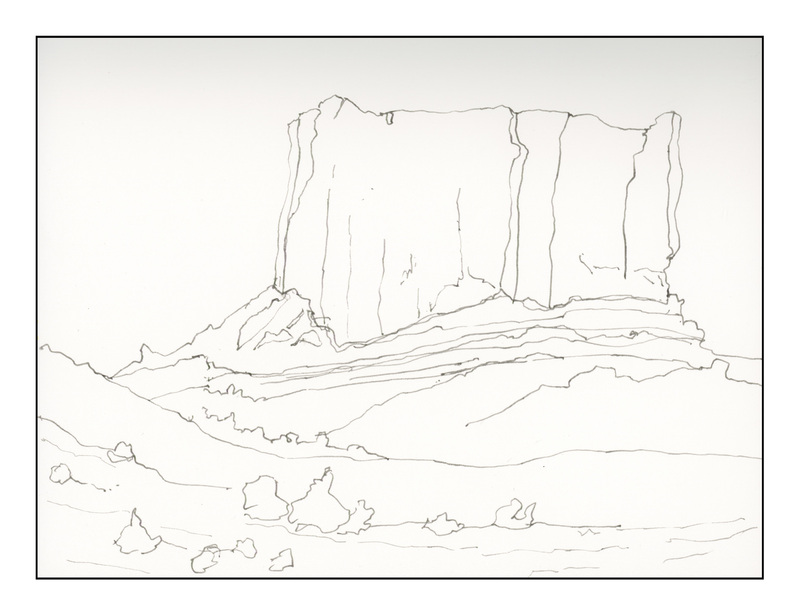 I tried to keep the lines minimal, enough to capture important elements of the landscape, but not so much that they become dominant or what will (eventually) hold the image together. Hopefully I will be able to work on shadows and light, working to good contrast. 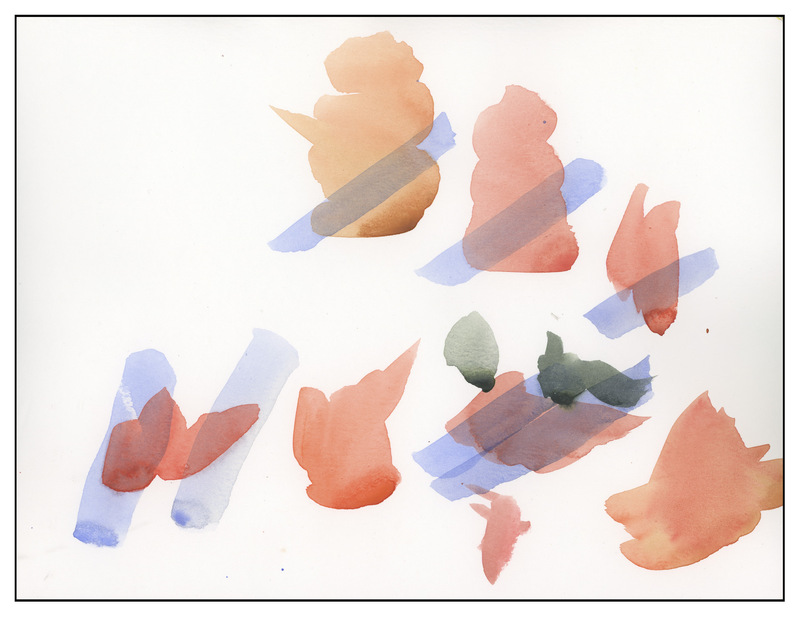 I seem to need lines – I am comfortable with them – that are clearly visible. Interesting to find out how we all work, eh?